The Nyköping talk was a disaster. The organiser had no remote control, but worse, their computer had a mind of its own. My carefully sorted pictures came up out of control, some were distorted and the last ones was absent. However the room was filled to capacity and public was kind and even seemed to enjoy my improvised talk. I was guided out of town. My guide was told not to go under low bridges as I was trailing my boat with the mast standing. He misunderstood the instructions. A big bang made me jump as we passed under a bridge. It was all dark. At 50 km/hour my mast had hit the bridge. The shroud knots had some flex and no damage was done. A good test for stormy waters. Apart from little incidents like the above one a trailable boat is a wounderful thing. It allowed me to bring my boat up to Stockholm over the week end. Not to mention last year when I trailed her to Ireland for a good start on my transat. She came back to Sweden from Martinique in a container and again I trailed her from Göteborg to Västervik. An outher time I trailed an outher boat to La Trinite France then sailed her to Newfoundland. From St. Johns she went on the road to Maine where I sailed her a few weeks before bringing her by car to Newport R.I. where she was sailed. Finally on the road again to New Jersey and shipping her back to Sweden. I strongly suggest a trailer able boat. Give her a strong bottom that you can let her down on concrete stone and other hard surfaces. Mine has a bronze sole, strong, antifouling, and a good earth plate for your lightning conductor. Below a bonus picture. 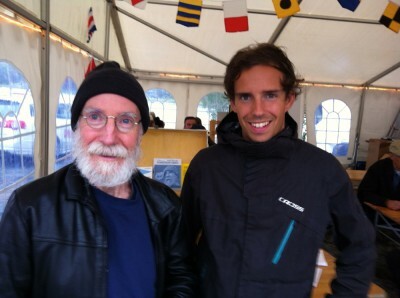 Me and my co-author selling the new book Den unge den gamle och havet at the boat show.